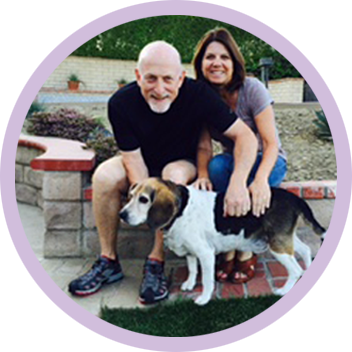 “I’ve known Kim for over 10 years and have witnessed first hand the love and care she gives all her critters. That same love and care extends to the pets of her friends and customers as well as to the many rescued animals she has fostered and placed. Her wealth of knowledge and experience in the pet care industry and animal rescue communities are worth noting. They include knowledge of the best pet foods, diets for special pets, pet care, training and behavior to breed specific and rescue specific challenges. Her rescue efforts have spanned all the years I’ve known Kim and even included a refugee hound from Hurricane Katrina. “I have known Kim Santell for over ten years. I was one of her first clients at Planet Doggy Daycare, and I have to say she was a savior for both me and my beagle Charlie. She took care of my precious one as if he were her own and never hesitated to share her time, knowledge, and expertise in training, healthy foods, safe products, and resources, with all of her clients. Kim is a consummate professional with a huge heart. “I have known Kim Santell over 12 years. Our meeting was a result of my owning a petsitting service and she a doggy daycare. I could tell from the moment I met her that her priority was always the dogs. She was attentive, loving and dedicated to their care. During the 12 years we have known each other, she has rescued countless dogs and cats. All of the veterinary care and maintenance is paid for out of her own pocket. Kim Santell has been a friend of mine for several years. Met her first on a tennis court, and she proved to be an outgoing and very vocal player, quickly becoming well known among the league members. A visit to her home is an unforgettable experience; you’re first greeted by a loud chorus of barking and licks and sniffs, and when the initial excitement has abated, you are impressed by the calm and peace as they relax settle down. The calm is occasionally broken by her latest addition, a little tabby kitten that runs around fearlessly playing with the dogs’ tails. Her devotion to animals is not restricted to those that she owns. She is constantly involved (has been for years) in facilitating the rescue of dogs from shelters across the country; contacting, coordinating and arranging transportation to people who are fostering or adopting.Following the aftermath of hurricane Katrina she was involved in rescuing and adopting some of the many abandoned and orphaned animals. She is a constant presence on Facebook networking with other animal welfare advocates to transport animals from high risk shelters, to foster homes and potential adopters. Such devotion is rare these days, when there’s just so much of a problem both with homelessness, and mistreatment so common. Kim is a hero in my mind, and to all the animals whose lives she has directly and indirectly touched.